Tree Bressen served on the FIC Board from ’97 – ’03 and got her first “training” as a group process consultant living at Acorn Community, VA. She is one of the creators of the Group Works deck. Full bio below. For more 30th blog posts click here. I’ve been a group process consultant for the better part of 20 years, with an emphasis on supporting intentional communities. While my primary skills come from lived experience, i* am grateful for opportunities to further develop my knowledge through books and trainings. Last year i was introduced to a book that’s affected me more than any other i’ve encountered in my field. 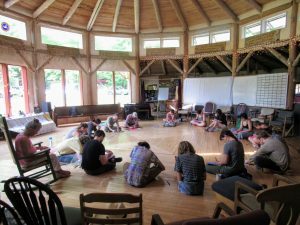 Here’s why, and what i think it has to offer intentional communities and similar groups. Evolutionary purpose—a mission that is honest, clear, motivates people’s behavior, and guides day-to-day decisions. Wholeness—welcoming people’s full, authentic selves into the organizational space. Self-management— distributing power and authority throughout the group in a meaningful and effective way, trusting individuals and teams to act in the group’s best interest. “So what?” i can imagine some of you saying at this moment. “Aren’t we already doing all that?” Well, yes and no. It’s true that people join intentional communities from intrinsic personal motivation married to group purpose, since (unlike the companies in the book) no one is paid to be there. The typical community purpose may be cast a bit too broadly for daily guidance, but generally members have enough in common on that front to make it work. 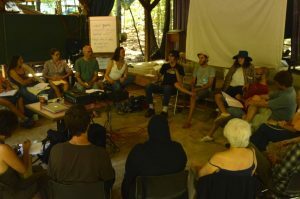 Further, in my experience, intentional communities do a much better job at welcoming people’s full selves than many other types of organizations—it’s hard enough to wear a professional “mask” at work, almost no one could manage it full time at home. 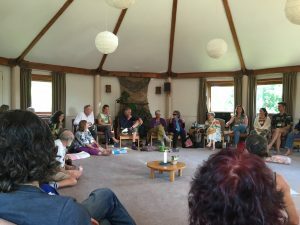 Practices that Laloux finds striking, such as personal check-ins at the start of meetings, are very old hat for community living groups. Some of our communities could do better at annual reflections and supporting psychological safety, but with so many community founders and joiners influenced by the human potential movement, ICs are way ahead of the mainstream on this. So what about self-management? Aren’t we already doing that too? Sure, in the sense that, for example, your average cohousing group does not hire a property management company to collect fees and schedule maintenance; the group does it themselves. And yes, in that, unlike all of Laloux’s examples, in most secular ICs there is no central leader with any significant power. Nonetheless, i think his model points at something important for the communities movement. Traditional, old-paradigm hierarchies put one person at the top. By the nature of the system, whoever is cast in the role creates a bottleneck in decision-making, is out of touch with the front-line impact of the decisions they do manage to make, tends to fall into abuse of power, and all the other problems people lower on the status chain are painfully familiar with. In legitimate rebellion against that model, our egalitarian organizations toss out the boss, who is replaced by community meeting as the ultimate authority. Great, now we all have power, right? Well yes it’s an improvement . . . but like many other solutions to organizational problems, this one holds the seeds of the next dilemma. Have you ever been part of a group where you were held back by the need to get permission from everyone in order to do something cool or important? Has someone you love taken on a leadership role (formal or informal), and felt poppy-lopped (cut down so one head would not stand higher than others)? When community meeting is the boss, instead of gaining permission from one person, it must be gained from everyone, and unintentionally and unfortunately, that can be a gauntlet only the most persistent and diplomatically talented succeed at. Even a well-functioning consensus group (and we know there are many poorly functioning ones) takes time and effort to render decisions. The Quakers, respected consensus practitioners with a tradition stretching back centuries—who have indirectly influenced much of the communities movement—have a saying: “Some issues won’t see a shift until we’ve had a few funerals.” If we need to wait that long, until we have permission from every person no matter how much of a stick in the mud, what is lost in the meantime? Community thrives when it strikes the right balance between group and individuality. Too often a well-intentioned, carefully wrought consensus process may, over time, drive out those with the most passion, initiative, and energy to offer. American interest in sociocracy arose from this concern. In recent years much dust has been thrown up in debates over sociocracy, particularly regarding whether or not it’s a form of consensus. I spent a long time learning and listening to friends and colleagues excited about it to discern what’s distinctive and from whence the enthusiasm came. I finally settled (for now, at least) at believing: (a) yes, sociocracy is clearly a type of consensus, a direct spin-off from Quaker education, and (b) for the people who are eager adherents, at the core that’s because they believe groups would be better served by shifting their default answer from No (“we aren’t going to adopt that proposal unless you can convince everyone”) to Yes (sometimes in the form of “good enough for now, safe enough to try”). If successful, it’s a significant shift, but i think it doesn’t go far enough for people to fully thrive. And Laloux’s work goes further.I’m not suggesting we’d be better served by letting individuals run roughshod over their community mates. That’s not the answer. What Laloux offers, via what he calls the “advice process,” is a way of threading the needle, finding a path between group power and individual autonomy different from what most intentional communities practice now. The advice process requires people to consult with two constituencies before moving forward on a decision: (a) those who would be impacted, and (b) those who have expertise in the area. Consultation rather than consent. The power of influence, not the power of permission. A small change with enormous consequences. In this model, teams and individuals are trusted to act on behalf of the group’s well-being as a whole. Every person is given full power and access to resources. The constraint on that power is the requirement to consult, and to be influenced by what is learned in doing so. Consultation takes a wide variety of forms. It can be as simple as walking down the hall for a one-on-one conversation. It can include the salons and community meeting sessions we are familiar with. At a distance, it can happen through online tools such as Slack (chats organized by channel), Loomio (for decision-making), or blogs enabled with comment streams (as used by Buurtzorg, a Dutch healthcare company that is one of Laloux’s prime examples). At scale in person, it could happen through a large summit or conference. The form depends on the context; what matters is fulfilling the principle. In applying this model to intentional communities, while i presume some decisions would still be reserved for the full group (e.g., dissolution, or adding a major new building), it is a great challenge to ask ourselves: What would it take to let go some of our control? What might happen if we allowed people’s life energy to flourish more, while maintaining robust feedback loops? How much are we willing to trust each other? The nonprofits and businesses who have successfully adopted this way of being have reaped tremendous rewards: happy staff, low turnover, high profits, success and respect from their peers. I imagine similar benefits will come to intentional communities able to join this cultural shift—we won’t really know until we try it out. Intentional communities have long been leaders in social experiments, hopefully edging a bit closer to utopia at each turn. Who’s ready to explore together? If you are curious, click here for links to the book and other materials. *i: The use of lower-case i in the middle of sentences is a deliberate linguistic choice, reflecting a belief that “i” am the same as any other, no more or less important than “you” or “she” or “they.” English is the only language that capitalizes the first-person and no other pronouns, an unfortunate, individualistic, ego-reinforcing convention. Tree Bressen lived in intentional communities and shared households for many years; her current household commitment is to one lovely calico cat. She served on the FIC board 1997-2003. 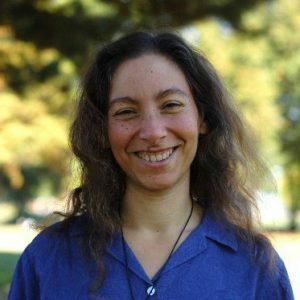 She is the founder of Group Pattern Language Project, collective authors of the deck Group Works: A Pattern Language for Bringing Life to Meetings and Other Gatherings, available for free download. Based in Eugene, Oregon, she consults with a wide variety of groups on how to create fulfilling organizations.